Last week we got our headliner announcements in regards to UFC 239 as two titles will be defended when featherweight and bantamweight champion, Amanda Nunes defends her latter crown against Holly Holm. And in the event’s featured attraction, light heavyweight champion, Jon Jones faces Brazil’s ‘Marreta,’ Thiago Santos. 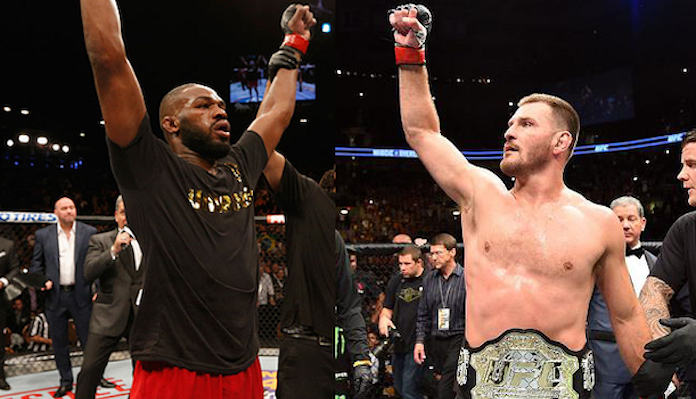 However, on the day of that announcement, it looked like things were actually pointing in the direction of a big heavyweight clash between Jones and former champion, Stipe Miocic. Jones’ longtime coach, Mike Winkeljohn says otherwise though. “I thought we were fighting Santos the whole time,” Winkeljohn said on Submission Radio. “I have no idea if the UFC was involved in it or that was just Jon pulling his leg. I think the UFC would have to throw a lot of money at him. They want to make money too, so I can’t blame Jon for wanting to make some money as well. For Jones, since reclaiming the title at the end of 2018 against Alexander Gustafsson, he’s already defended his title successfully when he earned a unanimous decision over Anthony Smith at UFC 235. If he defeats Santos at UFC 239, he will have a total of 10 title defenses to his name.